WASHINGTON - U.S. 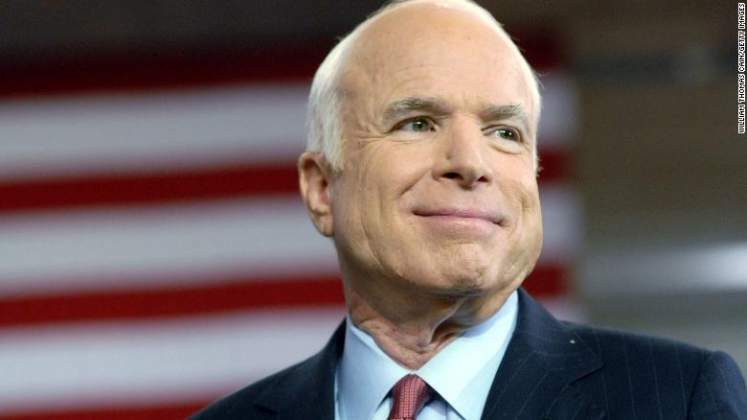 Senator John McCain, a former prisoner of war in Vietnam who ran for president in 2008 as a self-styled maverick Republican and became a prominent critic of President Donald Trump, died on Saturday, his office said. He was 81. He died on Saturday afternoon with his wife Cindy and other family members at his bedside. "At his death, he had served the United States of America faithfully for sixty years," said a statement from his office. Flags were flying at half-staff at the White House yesterday morning, hours after Trump tweeted his "deepest sympathies and respect" to McCain's family. Paying tribute to his 2008 election opponent, former President Barack Obama described McCain as an idealist and said there was "something noble" about their political battles. Cindy McCain said her husband had "passed the way he lived, on his own terms, surrounded by the people he loved, in the place he loved best." "My heart is broken. I am so lucky to have lived the adventure of loving this incredible man for 38 years," she wrote on Twitter. The vacancy created by McCain's death narrows the number of Republican-held seats in the 100-member U.S. Senate to 50, with Democrats controlling 49. Republican Arizona Governor Doug Ducey was expected to appoint a member of his own party to succeed McCain.